Last month, Norwegian Air announced new routes from the US to several cities in the UK with introductory fares starting at a jaw-dropping $65 one-way. Today, the carrier shared some more new routes that will be operated by its new Boeing 737 MAX aircraft — this time with fares starting at $89 one-way with service to Bergen (BGO). These new routes are now available to book on Norwegian’s website. If the carrier’s introductory $65 one-way fares from its previous announcement are any indicator, these might not last long. So, if you’re thinking about taking advantage, it’d be best to jump at the opportunity now rather than later. Keep in mind, however, that Norwegian is a low-cost carrier, meaning you may be charged for some of the things that may be complimentary on other carriers. 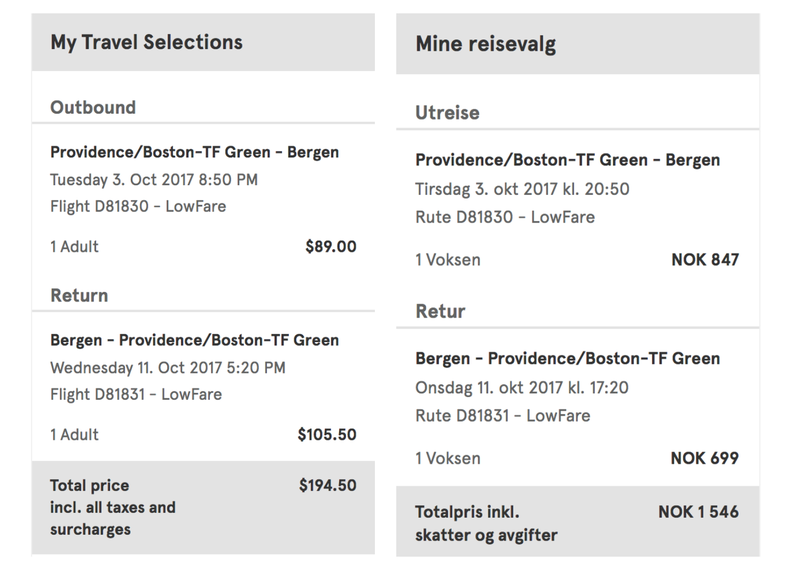 During a sample search for these new routes, I was able to find a round-trip ticket between Providence (PVD) and Bergen (BGO) for $195 round-trip in October when booking through the US version of Norwegian’s site. However, when I went to book the same dates on the Norwegian version of the website, I was able to score the same ticket for about $12 less — saving me around 6%. This trick doesn’t always work, but it’s definitely worth checking to see if you can score some extra savings. As a reminder, these new routes will be operated by the carrier’s new 737 MAX aircraft, which offers 189 economy sets in a 3-3 configuration. Unlike with the carrier’s 787 Dreamliner, which it flies on transatlantic routes from some of its larger markets, the MAX will not feature a Premium cabin. While maybe not as sweet as the $65 one-way fares offered in its original announcement, these $89 one-way fares are definitely something to get excited about. And from the sound of it, Norwegian plans to continue developing these routes, allowing it to offer travelers some of the lowest fares we’ve ever seen on transatlantic travel. Featured image of Bergen, Norway courtesy of scanrail via Getty Images.